Growing up, Christmas was the same event year in, year out. The same meal, equally identical decorations and mince pies indistinguishable from one another. That’s not to say that any part of what was dished up was disagreeable, but change helps keep occasions exciting. 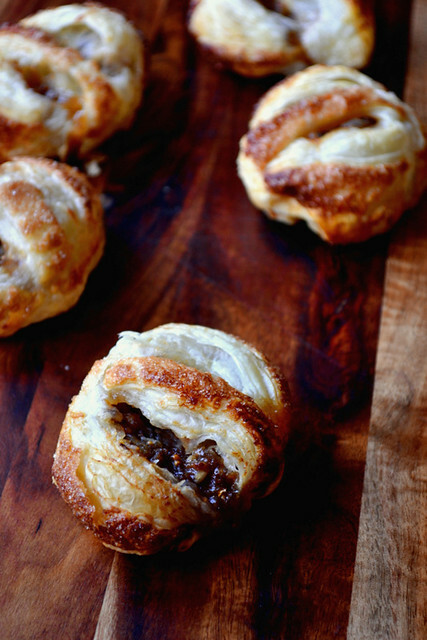 A quick and easy rendition of the classic mince pie, these Eccles Cake Mince Pies are packed full of homemade mincemeat and made with flaky puff pastry. Christmas indulgence at its finest. Named after the town of Eccles on the outskirts of Manchester, in the North of England, Eccles cakes are small round pastries or cakes usually filled generously with currants. Traditionally speaking, Eccles cakes would be made with a pastry more akin to rough-puff, but pre-rolled puff pastry makes for a very light, easy and quick to produce cake. This recipe is Christmas for those in a hurry. 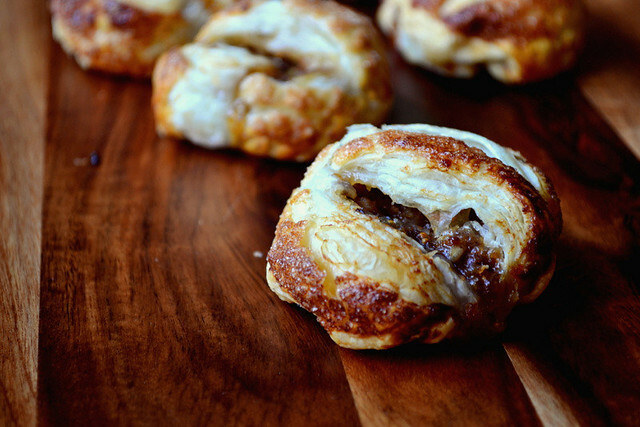 The use of mincemeat is a logical jumping-off point on the way to making eccles cakes. Being a currant mixture itself – albeit with some added festive cheer (brandy) – mincemeat lends itself perfectly to the filling of Eccles cakes; a match made in heaven. 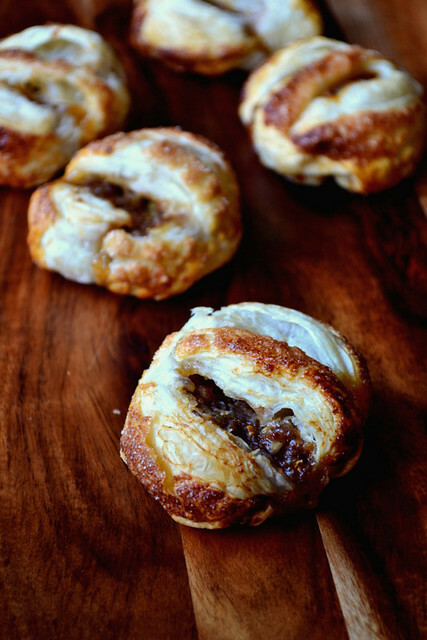 Eccles cake mince pies couldn’t be easier to make. Simply cut a few circles out, fill them generously with mincemeat, seal with egg, pat down and slice; a whole batch can be ready to eat in under 30 minutes. Though the recipe below makes only 6 eccles cakes, you’ll be glad to know that it lends itself well to scaling up. Make as many as you like, but be careful not to bake too many at once; the oven temperature needs to be consistent for the lamination of the pastry. Of course, if you would prefer a classic shortcrust mince pie there’s a recipe for that too. Or for something a little different these mince pies topped with homemade marzipan are just the ticket. Cut 6 circles of puff pastry, 10 cm in diameter. Preheat the oven to 200C/180C(fan). Line a baking tray. Dollop a teaspoon of mincemeat in the centre of each and brush the edges with the beaten egg. Fold the pastry gently over the mincemeat to create a sealed disc. Turn over on the prepared tray so the sealed side is down and gently flatten. Slice two holes in the top of each pie, brush with the remaining beaten egg and sprinkle generously with sugar. Bake in the oven for 10-15 minutes, until puffed up and golden brown. Leave to cool for 5 minutes and consume warm with cream or ice cream. 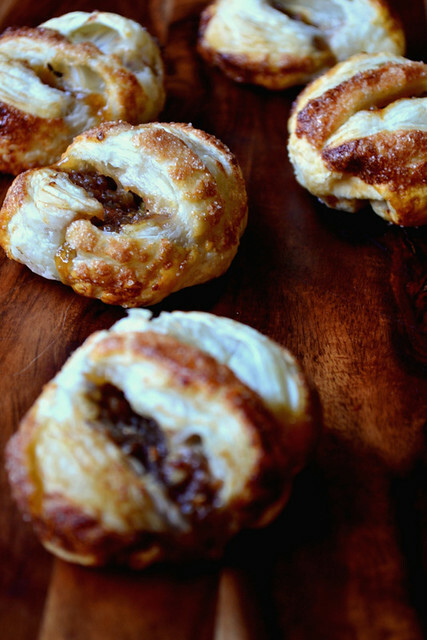 Cost: Using homemade mincemeat and inexpensive pre-rolled puff pastry, these little festive eccles cakes should set you back no more than £1. Gorgeous! I was a bit disappointed by the Eccles cakes we found in Britain last year. Clearly I was in the wrong places. I should have come to your house! Yes, we hoard all of the best examples here. Indeed! Are you not a fan? Thanks! I wasn’t sure about the photos myself. They are very quick to throw together! Mmmm…….these look gorgeous. As you say, a change from regular mince pies. I feel compelled to have a go – there’s puff pastry in the fridge and a jar of home made mincemeat given to me by a friend in the larder – so why not! Please do – let me know how they turn out. So simple, but delicious too. I made these a few days ago for a group of French and Australian friends who had got together for a foie gras workshop. Everybody loved them and had seconds. I used Delia’s Quick Flaky Pastry rather than supermarket ready rolled and your fruit mince recipe with some tweaking to accommodate what I had on hand (so it’s got powdered cranberries and pickled cherries in it). I made a spiced cream cheese (cream cheese, icing sugar, homemade cherry liqueur, mixed spice) to dollop on the eccles cakes. I’ll definitely be making these again. Excellent – so glad you enjoyed. And kudos on making your own flaky. Nice idea for the cream cheese; perhaps I’ll steal it. I’ve had too many instances of poor quality supermarket ready pastry, so I never use it now. In my experience the fat in it has often gone rancid. That seems strange; I’ve never encountered rancid puff pastry. I always make my shortcrust, of course. ohh yum yum… they look so delicious!! Thank you – they were lovely, especially with home made mince meat. Thank you – they were delicious! Always bashing out the mince pies batch after batch, decided to be different this year, trying puff pastry for the first time and might add some cherry bits too. If your’re having them warm then I would go with cream, ice cream or custard, my own favourite. Excellent! They’re really nice and light with puff.